"This market is way overbought – a correction is coming!" We've heard that for weeks. I'm tired of it! It's not because it's wrong... but because, my friend, OF COURSE a correction is coming! The simple truth is that stock markets have corrections. (Corrections are typically defined as a fall of 10% from new highs.) If you can't handle that, then don't invest. The big question now is, could we see a correction during the current stock market "Melt Up"? But if we see a 10% correction during this Melt Up, would that mean the Melt Up is over? 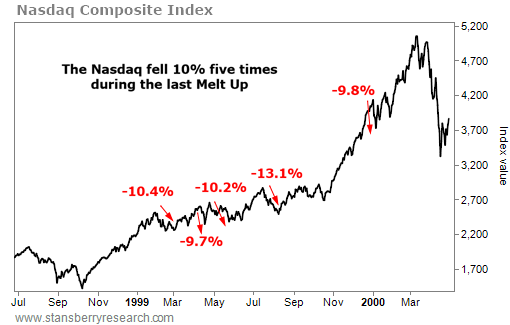 During the last great Melt Up in stocks – the dot-com boom of the late 1990s – the Nasdaq Composite Index actually saw five roughly 10% declines during its final push higher. These falls were quick. They all happened in a month or less. But don't think they weren't painful... A 10% fall in the broad index definitely meant larger declines in the more volatile stocks. During the worst of those corrections, you had to question if staying on board was the right move. These days, folks are used to a one-way market... They will certainly panic in a correction. My message today is DON'T PANIC. Corrections are normal – even in the Melt Up phase of a stock market boom. So please, don't be surprised if the market falls 10% this year. Based on history, it could even happen more than once. The next correction will be painful. It will feel terrible. But don't panic. A correction (or two, or more) does not signal the end of the Melt Up. Steve recently shared one indicator that has predicted each of the last three market peaks, going back 30 years. Learn how to use it right here: All Right, Mr. 'Melt Up'... So When Does It End?